Poor Kalla actually has a hard time climbing; their bodies aren’t really suited for leaning forwards, so it requires almost a crawl to keep the center of gravity low to the ground. 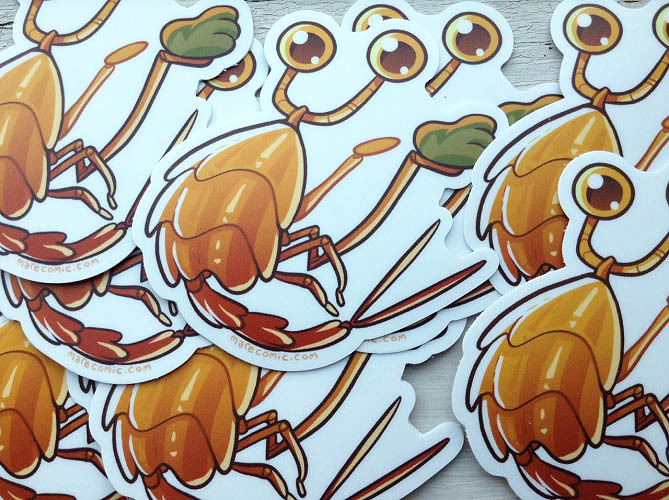 No news but old news… 1) The October Thrip sticker giveaway continues! simply comment for a chance to win 2) I’ve fallen a bit behind on Inktober sketches so the odds of $5+ Patrons winning a sticker with a sketch are increasing quite a bit :] 3) You can sign up for email updates to get your page updates right away, for days like this when I update at 1am when nobody should be updating, haha. I’ll keep the banner up until I get around to redoing the sidebar. 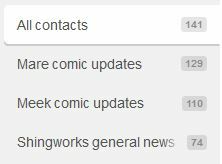 BTW, if you signed up and are not receiving updates, it’s probably because your confirmation email went to spam~ I see like 20 folks who are in the pending list, just in case you were wondering where the heck your emails are. No, they are both fantastic, but MI simply strikes a nerve! Kalla’s sass is a weapon of mass destruction. She’s havin’ none of that, Mike. You mean, a weapon of sass destruction? Now I really really really really really really really want to see Mike lifting Kallakore. Wollaria? Did I miss something or is this the first mention of her race/species/tribe? It is indeed the first mention. She did say it earlier, but Mike interrupted her, so we only saw a few letters. So now the question is what did the Wollaria call Mars. And since there is an extant civilisation, should we call it that too? Kalla is so cute now. It was funny… Ha. I suppose LEVi’s face may have left some things to the imagination. Are you trying to shittalk mah best bud?!!!! I find myself agreeing with LameFox–and trying hard to imagine HOW would LEVI make faces?? would it just project images? rearrange its optics? Curiouser and Curioser, to quote Lewis Carroll. If you look at the page where LEVi finds Kalla, you can see he has a little smiley light that seems to have several variable settings. So he at least has “smile” and “not smile”. Mike’s taking us ALL to the gun show, even if Kalla is unimpressed. Wasn’t Kalla originally a lot bigger than Mike? In panel 3, they look to be about the same size. Actually yeah, good catch! I don’t know why I missed that. Lol, I want to *have* arms like that! Arms like Kalla’s or Mike’s? You know, either one would be awesome. In completely different ways. Just have the best of both worlds with one human and one martian; become the ultimate ultimate human/wollaria fiddler crab…. thing! Im hoping to win one of your thrip stickers. Im a novice woodworker and am trying to design a thrip model, so any and all angles you can provide me would be gelpful. Muscle mass degrades FAST if you don’t use it – meaning Mike has presumably been hitting the gym CONTINUOUSLY since planetfall. He’s a great looking guy, but it wouldn’t surprise me if along with everything else there were some body image issues there, maybe even dismorphia. You’re not wrong! He was somewhat expensive to send to Mars because he negotiated for a higher daily protein intake % than usual. And like a lot of other folk on Mars, he’s also a volunteer for some clinical trials (in his case specifically for muscle/ bone mass retention). First frame, whats is on Kalla’s right shoulder? Mike’s pants? Haha, I don’t design people based on my personal preferences*, I find it creepy. He’s muscular cuz it makes sense for his character, but it is definitely amusing to draw! And yes, Kalla is helpfully hauling those pants around, since Mike has to wrangle that thighfriend. So this means that, at some point, we’re going to see Mike needing to drag/carry Kalla around right? Right?? Thighfriend you big goofball, quit playing with the speech balloon, they need that to talk. Anything to get away from that crappy sand!! Is it bad that I sorta ship these two goofballs? It would be worse if you didn’t. I wonder who would actually be stronger… I presume Kalla, but growing up in Low G would cause humans to grow taller and possibly bigger but not stronger. Its possible that although Kalla is very large, his bones are quite brittle or that he’s a little overweight and maybe Wollaria store fat mainly in their legs/forearms. Kalla hasn’t been enlightened to the words of the Allspotter, may Mike teach Kalla about Brodin and the gloriou gainz. Or, more accurately, the mass of mars is much less and therefore the pull of Mars’s gravity is less than the pull of Earth’s gravity. OH, I get what he’s saying now. Nothing personal against the thighfungus but… it disgusts… Ew.